Milwaukee Tool debuted the M18 Switch Tank. The M18 Switch Tank is an interchangeable sprayer and water supply system, which includes an interchangeable 4-gallon backpack sprayer. The tank’s powered base provides power to the backpack sprayer and has a frame with wide straps for comfort during extended spraying applications. The system delivers a 25-foot spray distance with no manual pumping needed. The five-mode pressure adjustment knob on the 4-gallon backpack sprayer adjusts pressure between 20-120 PSI, with a lower flow rate optimized for more control during targeted spot spraying. 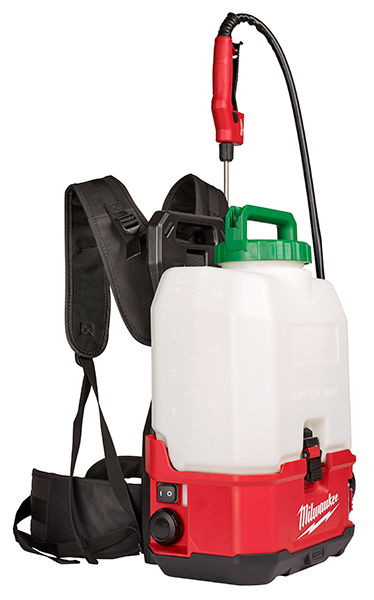 When equipped with an M18 RedLithium XC3.0 battery, the backpack sprayer provides up to 12 tanks of spraying per charge. Also compatible with the tank is a 4-gallon backpack water supply and 4-gallon backpack concrete sprayer. One-year warranty for tank assembly.